No matter what the season, you can count on Paul Sullivan Insurance Agency to provide you with a great Fall River car insurance policy in the surrounding South Coast region. As an independent insurance agency, we can give you options with some of the best auto insurance companies in the business. When autumn hits the New England area, there are a lot of new hazards, obstacles and risks associated with driving. Whether you are driving to work, dropping the kids off at school or taking a scenic drive to see the fall leaves, it is important to be alert and aware to the potential dangers that come with this time of year. As the leaves change color and fall off the trees, the temperature changes and the days begin to shorten. Things that we don’t even think about, such as a change in the sun glare before and after Daylight Savings Time ends, as well as the naturally shorter days, can affect our ability to see clearly and drive safely. Weather conditions change as well with more precipitation and eventually, snow and ice, as the season gets into full swing. It is important to work with your insurance company in Fall River to ensure that you have the coverage you require to protect you this time of year. One of the most important things to remember this time of year when driving through New England, is to pay attention to the leaves. Yes, the colors are beautiful and attract tourists from all over the globe, but they can also be very dangerous. Leaves pile up quickly on roadways, driveways and even sidewalks, making driving and walking more difficult. 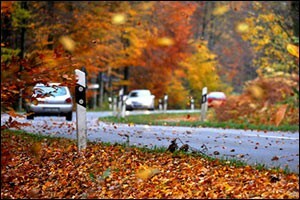 When leaves fall during inclement weather, the combination of rainfall and leaves can make for a very slippery surface. Keep an eye on the road and pay particular attention to areas that have a lot of leaves. Even dry leaves can cause hazards. Parking on top of a leaf pile can lead to a fire. The heat from underneath your car can sometimes ignite a fire on dry leaves, so be careful where you park. Make sure your tires are in good condition and get your brakes checked prior to the fall season to ensure that they are in proper working order. 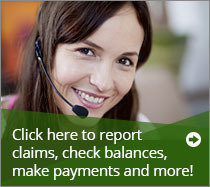 Check with your auto insurance in Fall River for even more fall driving tips. Human beings are creatures of habit. We get used to the way things are and have a difficult time when things change. Daylight savings time and the natural change that makes for shorter days in the fall and winter months, can mean that your daylight commute might start occurring in the dark. When you leave the office and it is already dark, the new schedule can mean reduced visibility. Be alert to these changes and pay careful attention to the roads and other drivers to help stay safe when driving home. Even if you are used to a particular route that you take to and from work every day, it is important to understand that there will be changes during this time of year. Leaves on the ground, slick roads, pedestrians, other drivers and bicycle riders – these can all be contributing factors in seasonal accidents, according to statistics from auto insurance companies. Drive slower than you usually do when you are driving in the daylight, and keep your eyes peeled for others out on the road. If you are not comfortable driving in the dark, consider alternative transportation or carpooling. While early darkness can be a problem for some, driving directly into the sunset can be a problem for others. In the summer, the sun was likely higher in the sky than when you are driving to or from work now in the fall season. The glare from the sun can cause driving difficulties and make it difficult to see other vehicles, pedestrians and bicycle riders. Traffic will often slow on highways and turnpikes when the sun is rising or setting, due to the light bouncing off of the vehicles and into drivers’ eyes. Be prepared for delays and distractions caused by the sun. Speak with your insurance company in Fall River regarding local laws about using shades, extended sun visors and other aids to help prevent the sun from getting in your eyes. Invest in a good pair of sunglasses and use them to help reduce the amount of glare in your face. Above all, just be patient with other drivers and give yourself enough time to get from home to work and vice versa so you won’t feel rushed. Autumn is a great time to contact your agent and ask to go over your Fall River car insurance policy to make sure you are adequately covered. Things change, so it is important to make sure that your policy changes reflect your unique and individual needs. Give Sullivan Insurance Agency a call at 508-679-9111 to ask about auto insurance in Fall River or to schedule an appointment to speak with one of our agents in person.